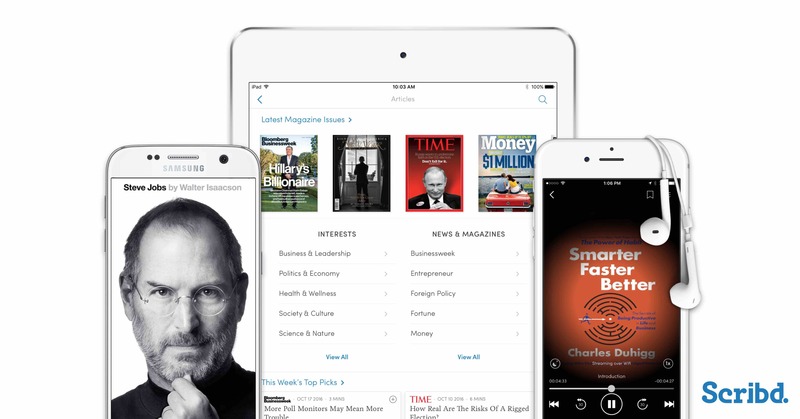 Scribd relaunched their unlimited audiobook and ebook service back in February. The company disclosed to Good e-Reader that in order to remain profitable they need to be able to maintain some semblance of control over the most voracious readers. Publishers are paid after a certain percentage of pages have been read, not entire books. This business model has been adopted by the big five and is non negotiable, this is why Scribd is throttling users. Once you download a certain number of titles, most of the bestsellers disappear and a smaller pool of content is available. During the next billing cycle the books are refreshed again. It looks like Scribd has decreased the number of audiobooks or ebooks a user can read or listen to each month, before they are throttled. When Scribd first unveiled their second generation unlimited service they were focused on former users coming back and doing business with them again. The old throttling limits were deliberately set high, in order to provide value. Over the course of the last month it looks like Scribd has changed their algorithm. Users are now throttled after listening to two audiobooks or reading three ebooks. Once your account has been limited you should see a coming soon flag to any title in your wishlist. Another indication that you are limited is when most of the catalog and known titles from big publishers start to disappear and there is suddenly a lack of quality content. Although audiobooks and ebooks are subject to limitation, the company does have a selection of magazines, sheet music, articles and other content that can be consumed indefinitely. I can’t really blame Scribd for doing what they are doing, since this is the only way they will stay in business. I just wish they were more transparent about the limitations. I suppose Scribd does not want to be forthcoming since the bulk of their revenue is from casual readers that only consume one title per month. I wish all companies would STOP labeling these services as “Unlimited” because regardless of ones appetite for said content. It is just wrong to label something as unlimited and then put limits on it. But I know they only care about getting that initial money and touting increased subscriber numbers even if they lose half or more when the limits of unlimited are discovered at some point. I was cut off after one book. Whats the point of moving from a credit system to unlimited if you can still only listen to one book?